Extra charge of £15 each pet per booking. £50 deposit secures a booking; balance on arrival, plus £20 deposit, refundable on leaving. The caravan uses an electric meter that accepts £1 or £2 coins only. 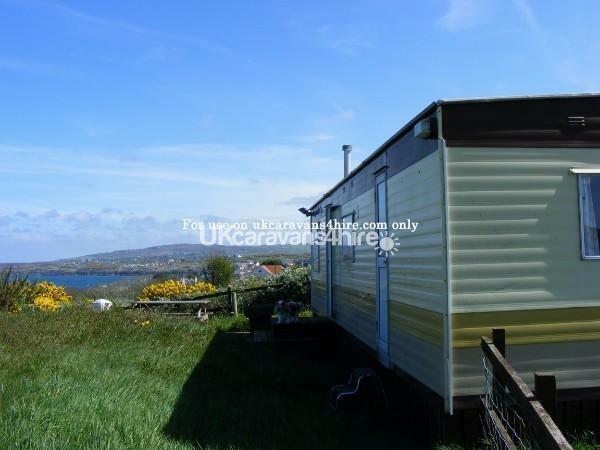 Private caravan, totally modernised and refurbished, on a small holding with breathtaking, uninterrupted, panoramic sea views. 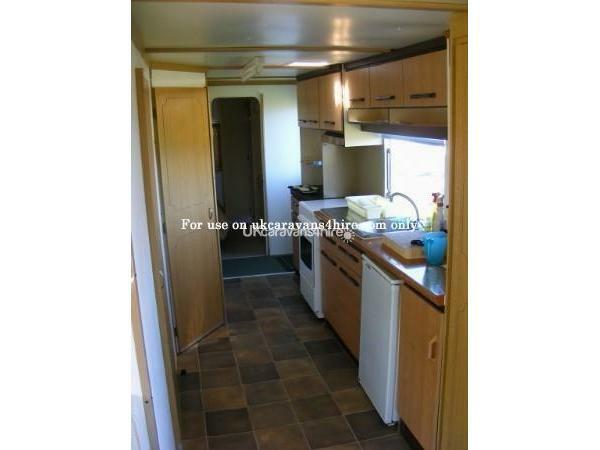 Up to 2, small dogs (maximum 14" shoulder height) allowed in the caravan. There is an extra charge of £15 each pet per booking. £50 deposit secures a booking; balance on arrival, plus £20 deposit, refundable on leaving. Telephone enquiries are preferred to emails. Visitors are required to provide their own sheets and towels.Pillows, p/cases, duvets and duvet covers provided. 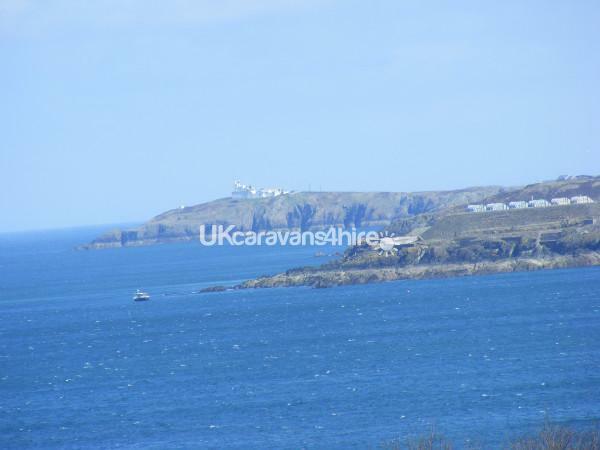 A 4 berth, 2 bedroom caravan on private headland property with sensational sea and country views at picturesque Porth Llechog ( Bull Bay) on the northern coast of Anglesey. This is a designated area of outstanding natural beauty, which spiritually inspires and promotes a feeling of peace and tranquility. The location is ideal for walkers, ornithologists, and wildlife enthusiasts. Please Click Here to view my holiday cottage for hire in the same location. There is direct access from the property to the headland coastal walks. The celebrated coastal walks provide the opportunity to see maritime birds and animals. Cruises are available nearby to get close up and personnel with the seal and puffin colonies. There is a nature reserve at Cemlyn which is famous for rare sandwich, arctic and common terns. Also an ornithological haven can be found at South Stack; run by the RSPB there is a bird watch observatory, close to a lighthouse which the public can visit. Roughly half a mile from your holiday venue is a golf club where you can have a relaxing game and then fully relax at the "19th hole". Anglesey hosts an impressive ecclesiastical history and there are churches dating back to the fifth century. Saint Patrick was ship wrecked at one location, and a church was built in thanksgiving for his survival. The sarcophagus of Joanna, daughter of John the first of England, rests in another Anglesey church. Charles Dickens, the famous 19th century novelist, visited yet another church and established a fund for a memorial which still stands today, in memory of over 400 lives that were lost in one of the most devastating shipwrecks, the Royal Charter, off the North East coast of Anglesey in 1859. Anglesey has a wealth of historic interest; there are sites of iron age forts, bronze age villages, burial mounds and standing stones of our ancient ancestors. Anglesey was the final refuge of the druids, before they were mercilessly slaughtered by the invading Romans. Even England's Tudor Monarchs (Henry VII, Henry VIII and Elizabeth I) originated from Anglesey. At Beaumaris there are the ruins of the castle built by Edward I, the old jail and Court House which can be visited. In Penmon there is a priory, housing, a thousand year old Celtic Cross. On the Menai Straits there is the glorious stately home and gardens of Plas Newydd. Nearby is the village with the longest name in Europe, Llanfairpwllgwyngyllgogerychwyrndrobwllllantysiliogogogoch. Also interesting maritime life can be seen in the Sea Zoo and at Butterfly Palace you can walk through tropical gardens and see a plethora of graceful butterflies, birds and reptiles. You can visit a working windmill at Llanddeusant, and follow the "Copper Trail" at Parys Mountain. In the 17th Century Amlwch was the greatest copper producer in the world. There is so much more to do and see, apart from the usual beach activities in Anglesey!! Let your soul be nourished and enriched!! We have just recently stayed at this caravan for the 2nd time. Ann makes your stay so wonderful . She does her upmost to give you a good time and provides so much information about Anglesey. She is a wonderful lady and my girls loved feeding the dogs and talking to Ann. The caravan is very well equipped. We can't wait to stay again. It's the best caravan we have stayed in. What a lovely week we have just had here. Ann is a wonderful lady, eager to help in any way. 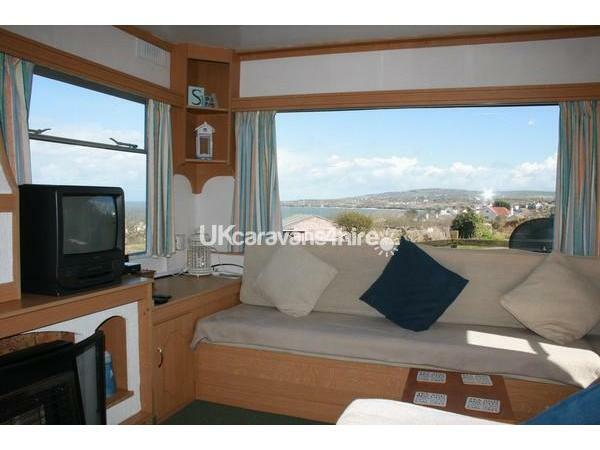 The caravan is clean, modern and comfortable and the views are outstanding..so peaceful and quiet too. Lovely walks down the coastal path from the caravan and bull bay itself is a 5 minute stroll. Cannot recommend this enough. The first of many holidays here for my husband and I. This is now our go to place. Thanks to lovely Ann for making us so welcome. We will be back. Thanks for the gr8 review, Norma and Geoff. It was so nice having such light-hearted and fun -loving people staying. I really enjoyed chatting and laughing with you.I forgot to ask your secret to looking so good, Norma! Glad you enjoyed the "rodeo show" here, before you left.Hope to see you sometime in the future. My very finest wishes to you both, Ann and all my girls. What lovely comments, Christine.I find it such a pleasure to have lovely people like yourselves staying here.From a drizzly start, the weather picked up quite nicely for you.It was great that Vicky achieved her ambition of seeing dolphins in the wild, from the nearby coastal path. So glad you all enjoyed your break. Looking forward to your return visit. Just give me a ring when you know which dates you would like next year, Vicky. My finest wishes to you all, and little bouncing Maisie. Just had a 5 night break with my 2 teenagers and their friend,plus our small dog.the van is well equipped and spotless.the views are stunning and make for a very relaxing break.we had a few walks and spotted seals and dolphins in the bay.best of all was meeting Ann,a lovely lady who could'nt do enough for us.if you are after a relaxing peaceful break with fishing,crabbing,boat trips,coastal walks etc you wont get better value anywhere else,or a warmer welcome. 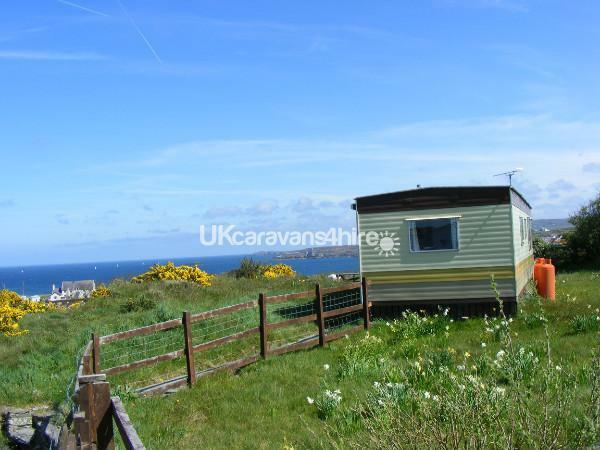 We have just returned from our wonderful stay at this caravan. Ann cannot do enough to make your stay wonderful. The caravan is well equipped and she goes above and beyond to provide everything to make your stay comfortable. We highly recommend this caravan. Our girls loved playing with Ann's dogs and the ponies are beautiful. The views are amazing and the area is beautiful. We will be booking to go again very soon. Thank you so much for such a complimentary review.I am pleased you enjoyed your stay so much.Jessica and Isla did enjoy seeing which little dog would finish their meal first and be the winner.The dogs enjoyed getting their treats from the girls afterwards.So glad your holiday provided good experiences and happy memories. Looking forward to seeing you next year. Best wishes, Ann and all the animals. Really enjoyed staying here. The view from the caravan is stunning. It is so peaceful and relaxing with the dogs and the ponies. Our dog was allowed to roam free around the owners land which was great for us, as he wasn't restricted and we could relax. 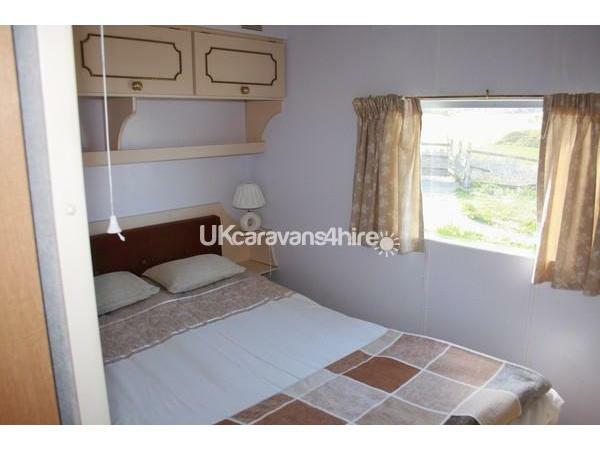 The caravan is lovely and clean and the bed is comfortable. Woudl definately recommend. Thank you for your review. I am pleased that you enjoyed your stay.My small dogs played quite happily with little Ozzie.Glad you found the location so relaxing--Sometimes that's exactly what we need.Best wishes and good luck for the future.Ann. A lovely couple of days "retreat". Thanks Ann for making me feel so much at home. Having loved it in stormy weather maybe I will love it even more next time! Thank you very much Anne for a lovely holiday! We could not have had a more enjoyable time. 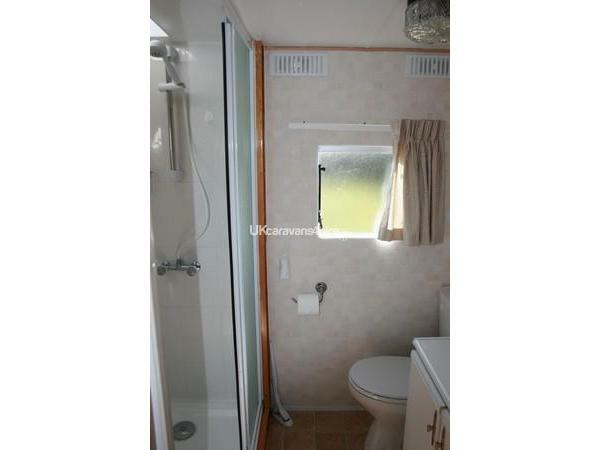 The caravan was lovely and clean, smart, cosy, comfortable, warm, and with everything that's needed. Anne was very clear in stating anything we needed? just ask! The Ponies are a delight! And a added bonus which our daughter now misses! 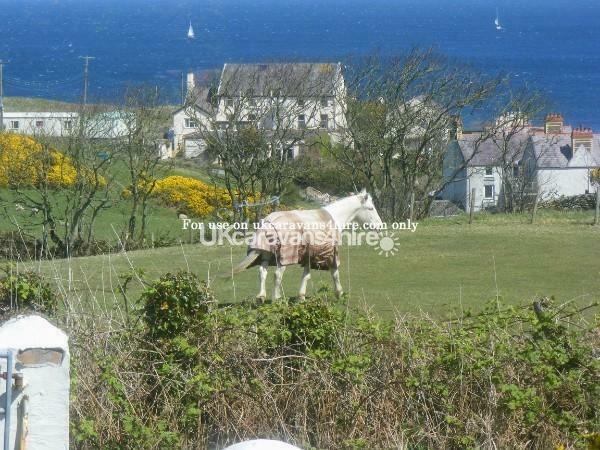 Wildlife is terrific, birds, rabbits, head across the field - sheep, to the coastal path and sea and watch Dolphin's!! The costal walks are fanastic. 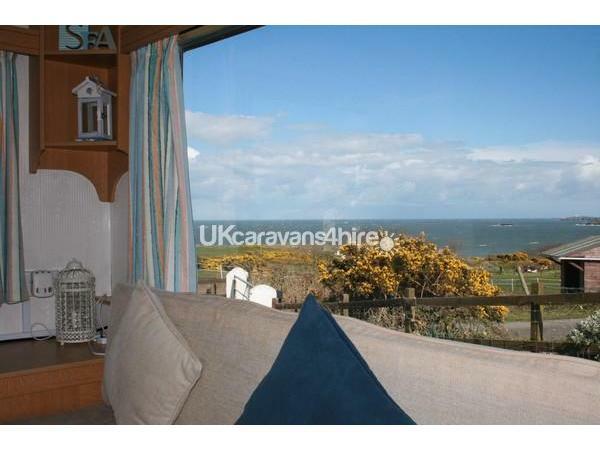 The view is stunning and has a good view from the caravan, so lovely to sit and look out, take some binoculars! Great area to be based, small coves, sandy beaches, buy a crab net! Amlech has a swimming pool and it great, good if its a rainy day. Parys mountain is also great to walk around. Everyone very friendly, We have been visiting Anglesey for many years but always have new adventures! Love it!! Thanks again Anne and take care from us all. Thank you so much Amanda, Adrian & Eva.It is great, having such lovely people staying in my caravan.I find it so satisfying when I hear that people have really enjoyed their stay. Thank you so much for writing such a lovely review.Thank you Adrian for the help you gave me with my car. You have got a budding artist in the family with the beautiful painting, of one of the ponies, that Eva did. It was a very mature and accurate painting for one so young.Nice people are a tonic to have staying at my property. Hope to see you in the future. Take care, God bless, Ann. We would like to thank miss garner for a wonderful weeks holiday. She was most welcoming , giving us all the information we needed about the caravan and leaving information about places to visit and things to do. 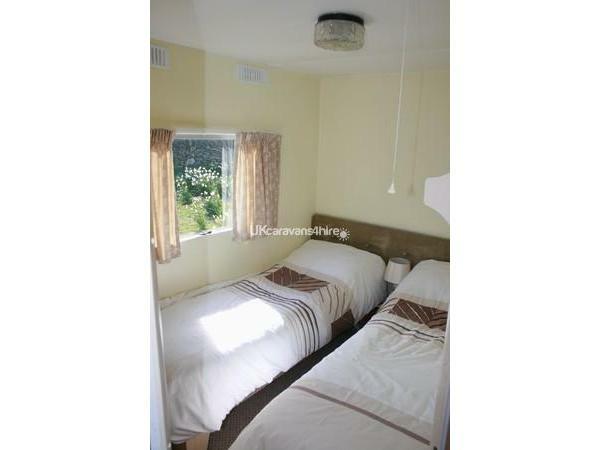 The place is stunning, the caravan has everything you need for a relaxing time. We will be returning as soon as we can. Look out for the Dolphins in the bay spotted from the caravan window.... Magical!!! Hi, just wrote to you y/day to thank you for the lovely note you left in the c/van. I am really delighted to hear you enjoyed your holiday so much.I try my best to make everyone's stay as pleasant as possible ,so to receive such positive feedback is really heartening.To have people like yourselves return to my caravan would be a pleasure.Take care, God bless, Ann Garner. We booked with Miss Garner, and was looking forward to a break due to having new arrival and not ideal taking her abroad. Upon arrival Miss Garner greeted us, shown us round the caravan and highlighted any issues or questions, don't hesitate to ask. Our son fell in love with the ponies and had a favourite, to which Miss Garner gave him a photograph to take away of the favourite pony and caravan in background, and he held it all the way home, and put it next to his bedside when we got home. The caravan is very clean, has everything you need, DVD player, Sky dish (bring your own box), Freeview, Microwave, it was like home from home. Pet friendly, our dogs were allowed to run free, if you want to go crabbing, the pebbled beach is less than 5 mins walk, all downhill. The views are beautiful, and with outdoor seating area, we had BBQ every evening. What lovely comments.Thank you so much.It was a pleasure to have a family like yours staying at my caravan.I am so glad you enjoyed your stay. I have only just discovered you left a review! (July '15)-Thank you for your kind remarks.I am so pleased you enjoyed your Autumn break here.Hope to see you in the future.